The purpose of the education and outreach program is to effectively communicate the activities of the Comfort Lake - Forest Lake Watershed District (CLFLWD) to Stakeholders as well as increase the awareness of the Stakeholders as to water resource issues and their roles in improving the quality of our water resources. Presentations to Cities, Townships and County officials, the preparation of newsletters, fact sheets and flyers, and conducting tours of CLFLWD activities are important aspects of the education and outreach program. Back by popular demand! Grab a friend and join us for a FREE lawn management workshop taught by a local turf expert! This time we’ll be offering both 90-minute sessions back-to-back; attend one session, or stick around for both! Topics include best mowing practices, fertilization guidelines, plant protectants, optimizing weed control, taking soil samples, reading soil tests, and picking the right fertilizer mixture. In late 2008, the CLFLWD became a member of the East Metro Water Resource Education Program (EMWREP). The EMWREP is a partnership formed to develop a comprehensive water resource education and outreach program for member partners. 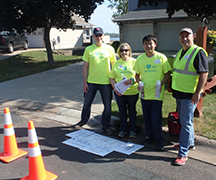 Over 22 partner organizations comprise EMWREP's membership covering all of Washington County as well as a small portion of Chisago and Ramsey Counties. Presented by Master Watershed Steward Jack MacKenzie, this informational series on turf grass best practices has provided many homeowners with the knowledge they need to manage their lawns. 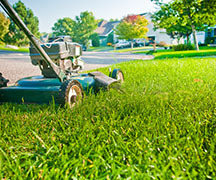 How short should I cut my grass? What fertilizer should I use? When should I fertilize? How do I take a soil test and what do the resutls mean? When should I treat my weeds? MacKenzie answers all of these questions and more! CLFLWD Program Assistant, Mike Sorensen, presented at the 2017 annual meeting of the Forest Lake Lake Association (FLLA). Topics discussed include water quality, invaisve species, and capital improvement projects. Master Watershed Steward Jack MacKenzie organized a community event aimed at educating the public on the importance of keeping storm drains clear of debris. Over 25 community members joined forces on September 23rd 2017 to stencil "No Dumping" messages in front of local storm drains. This is an ongoing community project, if you are interested in learning how you can help contact the CLFLWD office at 651-395-5850. 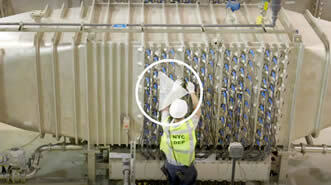 NYC watershed and water supply system. nature, especially forests, cleans water.